I had a lot of products nearing completion in August, so September ended up having a LOT of empties -- 23 in fact. Of these, four were not recyclable (or at least not clearly recyclable, and I don't want to cause any trouble for the facilities!) -- the Spacemask foil, AA Skincare wipe wrapper, Laidbare tube, and the Hurraw tube. I decided to reuse the Hurraw balm container for my own lip product creations, so that means I contributed three plastic packagings to landfill - gutted! 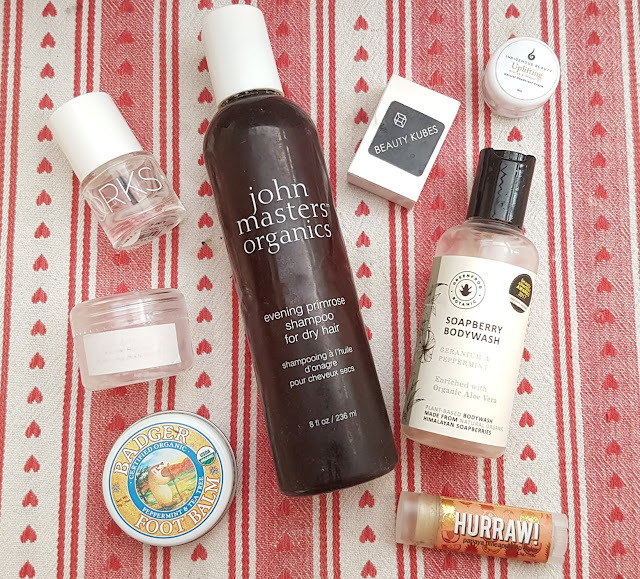 While I definitely wasn't perfect in terms of my waste, I was pretty lucky in terms of what I thought about each product I used up. There was not a single item I disliked. Sure, there were things I liked more than others, but overall I was pleased with the formulas, scents, and results of everything I finished. So that is a win for September's empties! Spacemask (1 mask): I have used these little eye masks before, and while they take some getting used to, they are fantastic for relieving stress, easing headaches, and soothing the mind for sleep. They are really easy to use, comfortable to wear, and last for almost an hour overall (possibly more, but I tend to doze off before the heat sensation wears off!). I have a box that I bought a while back, so will continue to use these when needed. Bloomtown Botanicals "The Cafe" Coconut Wax Candle (140g): This candles smells AMAZING and fills the entire room with the scent of vanilla coffee in minutes. The flame is super high, something I have never experienced with a candle before, but the wax burns evenly which is my main concern with a lot of candles. I love that there is no palm oil in this, and that the wick and wax are clean. Burn time was really good (around 25 hours), and I will definitely be looking into getting another of these. My only complaint was the glass ended up pretty black along the top edges as the candle got lower in the container. Bloomtown Botanicals "The Spring" Blue Clay & Indigo Leaf Soothing Mask (90g): This mask was non-drying, worked well for my skin, and was definitely a unique texture which made this product pretty memorable. It is pretty thick and a bit gloopy (not in a bad way) but it spreads well and makes for a perfect combination of detox and moisture boost. I actually ended up loving this mask for my arms, neck and chest (any areas that are exposed to light/pollutants on a regular basis) as well as my face. Plus it lasted ages! Celtic Herbal Lavender Candle (30g) and Lime, Basil & Mandarin Candle (105g): I've been lucky enough to try two of Celtic Herbal's candles now, one travel sized that I got from the most recent Natural Wellness Box, and one full size that I got from the May So Pure & Simple collection of The Natural Beauty Box. I have been really happy with both scents, and while the smaller size only burns for about 4 hours, the larger one goes for much longer (~25) -- for the price I think this is great. I will definitely be trying out more of their full size candles in the future. 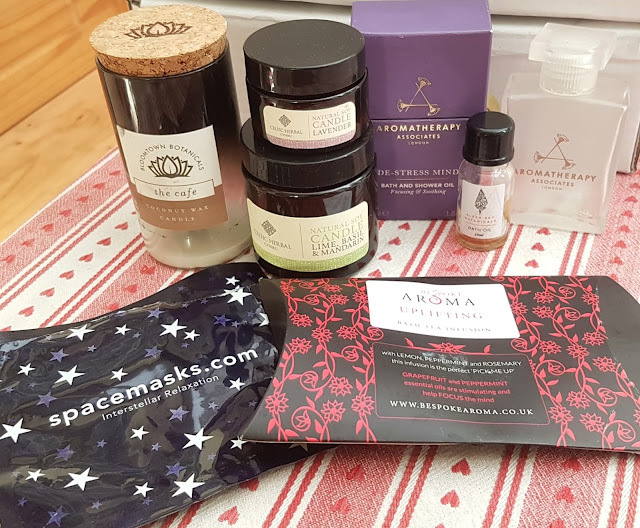 Bespoke Aroma Uplifting Bath Tea Infusion (25g): I got this tea infusion in the August edit from The Natural Beauty Box, and I used it almost immediately - it sounded too good to wait on! The scent was incredible, I loved how it turned bath water into a silky tonic, and really liked that you could use the excess on your body using the bag as a muslin. I want 29035810 more of these to be totally honest, but my only hangup is that these are single use. I really wish Bespoke Aroma would make refills and make the 'tea bag' a little sturdier so it could be used repeatedly. If that were the case, this would definitely become a staple in my routine. Aromatherapy Associates De-Stress Mind Bath & Shower Oil (55ml) and Aromatherapy Associates Inner Strength Bath & Shower Oil (55ml): I've mentioned this before, but I will say it again - I haven't bought any AA products in ages because their CF status is not very clear. I've been working my way through the bottles of things I was given before realizing this, and while some of them are great in terms of scent, I find a lot of them are actually pretty drying. Even the bath oils feel pretty thin. I will not be buying these again in the future, as there are so many brilliant brands on the market that are more transparent about their practices/ingredients. Greenfrog Botanic Soapberry Bodywash in Geranium & Peppermint (100ml): I got on with this bodywash really well - the smell is uplifting, the formula nice and smooth, and I felt like it was pretty gentle on my skin. It does not foam up like the handwash, but does leave you feeling clean so I can't really complain. I also found this worked as a decent addition to a bath -- it makes the water a bit milky and feels cooling on tired muscles. For the price, I think this is a great option. Badger Foot Balm in Peppermint & Tea Tree (21g): Another quality foot product - this was cooling, healing, and moisturizing which is pretty much everything I want in a foot balm. I like the tin packaging, and appreciate that there is a mini version of this as it is so easy to carry around for travel. The balm takes a while to sink in, but if you pair with foot mask 'socks' then you don't have to worry much about that. Hurraw Papaya Pineapple Lip Balm (4.3g): I love the Hurraw balms, and was very happy with this version. The smell is so juicy, the texture super smooth, and the balm very nourishing. It is the perfect way to keep summer going that little bit longer. While not as moisturizing as the Moon Balm, it is a great one to have in your coat pocket or those days where you just need a little bit of a healthy shine. Indigenous Beauty Uplifting Natural Deodorant Cream (5ml): Was well pleased with this natural deo - I brought it on my travels and it worked perfectly. Not grainy, lasts all day, and the full size comes in a glass pot which gets a thumbs up from me. I don't have to buy any deo for a while as my cupboard has been filled thanks to subscriptions, but this is definitely on my 'to try again' list. Beauty Kubes Shampoo for Normal to Dry Hair (3 cubes): I have already purchased a full box of these as I love them so much. They clean hair perfectly, are vegan friendly and plastic free, have a non-drying formula, and lather up loads without having any nasties included. I have found that my hair only needs half a cube most times as it is fairly thin, meaning the box will last me ages (since I only wash about 2x a week). John Masters Organics Evening Primrose Shampoo for Dry Hair (236ml): As I have mentioned in previous empties posts, JMO makes my favourite bottled shampoos, and when I heard they were changing their ingredients I panic bought a bunch for cheap. 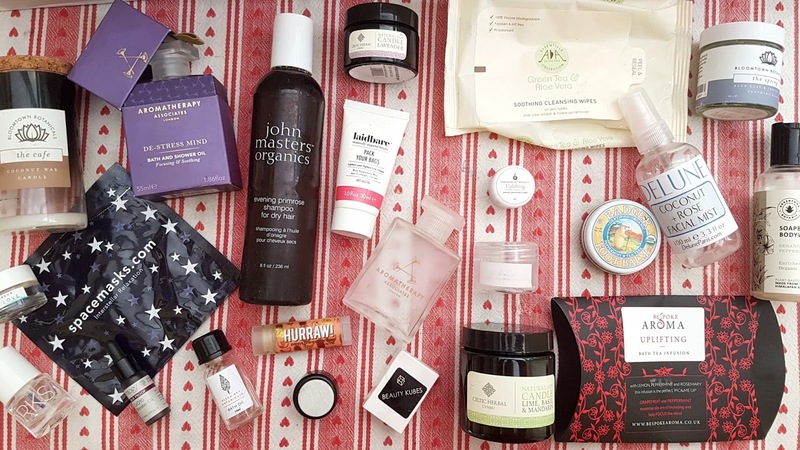 I switch between the evening primrose and the stimulating scalp formulas depending on what my hair needs, but have decided already that I will not be repurchasing once I run out only because I want to keep things as plastic free as possible. If this was in a glass bottle that might be another story, as my hair genuinely loves this stuff. Lola's Apothecary Delicate Romance Balancing Body Souffle (30ml): This body souffle is GORGEOUS. I have another 30ml pot left, and once that is finished I will definitely be tempted into buying the full size as this just smells and feels incredibly luxurious. It is super hydrating for my skin, has a lush scent that reminds me of a warm summer's day spent in the garden, and has such a delicate texture. It really is unlike any other product I have tried before, and quickly became a favourite. Glossworks 3-in-1 (9ml): I really like this clear coat, and think it does work well as a 3-in-1. The formula dries relatively quickly, works as a great base or topper, and helps double the length of time your manicure/pedicure lasts. The only negative is that the longer you have it the stickier and thicker it gets. After having it open for just a few months it had a noticeably different consistency from when I first used it. It is not 'off' it is just thick. I have another bottle of this, so will use that up and then decide if I want to repurchase. 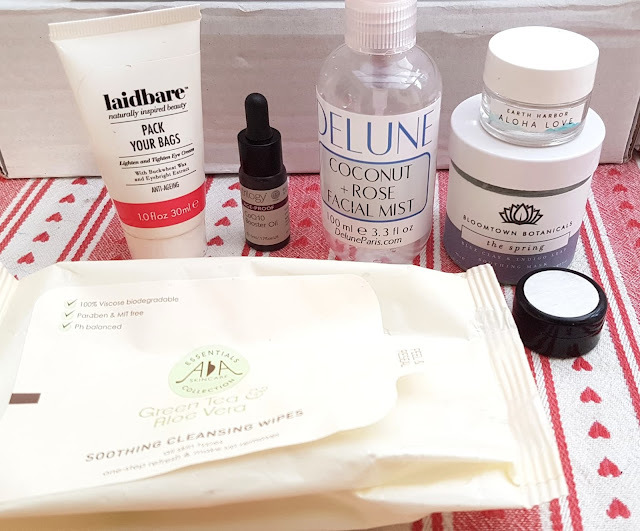 Delune Coconut + Rose Facial Mist (100ml): This was a new brand discovery through The Cruelty Free Beauty Box, and one that I really ended up enjoying. While I wasn't super keen on the apparent colouring, the mist itself was lovely and dispersed evenly. The scent is incredibly subtle making this good for anyone who doesn't want a strong smelling hydrosol, and while it is not ultra-hydrating, it is a great refresher throughout the day. I probably won't repurchase the Coconut + Rose variety, but I am loving the Green Tea + Jasmine one I have going now. Laidbare Pack Your Bags (30ml): This one was actually my partner's empty as it was too heavy for my skin. He, however, loved it. It is perfect for tired eyes and really does sort out puffiness and leaves you looking bright eyed and ready for the day. He has another eye cream to finish up first, but I think this will be a repeat buy as it is such a good price and gives great results. AA Skincare Green Tea & Aloe Vera (25 wipes): I reviewed these back in June, and stick to my original thoughts. They are a great wipe that is free from plastic (though the packaging is sadly plastic) and they work great for refreshing the skin and getting off grime. Something I missed in my original review was that they do indeed contain phenoxyethonal -- this is why I had that tingling sensation, not the alcohol! As I said before though, I used these mainly for my arms/neck/chest rather than my face and find them a good option for traveling or long days out. Evolve Hyaluronic Eye Complex (5ml): I was really unsure about this at the start when I got it from The Cruelty Free Beauty Box, as the formula is a liquid and I was really unsure how to apply and keep the pot sanitary. Plus, eye products tend to be hit and miss as many leave me breaking out. However, I did end up really liking this eye complex in the end - it was gentle enough for my semi-sensitive skin and while I did not notice loads of difference in terms of brightening, my under-eye area was definitely looking healthier. I may purchase the full size version to see how I get on with it longer term. I reviewed this a while back, and while I do wish I had waited to use it up during the colder weather, it had a crack in the lid so I had to be quick so it didn't go bad! It is really lovely and moisturizing, and left my skin feeling soft and very nourished. I think it would have been a bit heavy in the heat of summer, but worked great for cooler mornings and evenings when my skin needed a bit of a pick me up. My favourite thing about this cleanser (other than it being in glass rather than plastic) is that it is 89% organic -- no having to worry about GMOs or harmful pesticides! Trilogy Age-Proof CoQ10 Booster Oil (5ml): I love Trilogy, and this little bottle helped convert my partner as well. This is another one of his empties, and his skin drank this stuff up. He has mature, dry skin and the Trilogy oil really helped hydrate his parched face and left him looking more radiant. You only need a few drops of this as it is super potent, so even this tiny bottle lasted quite a long time. He has a few other creams and oils to make his way through at the moment, but this is at the top of my list for him once my stash for him thins out a bit. Like I mentioned at the start, I was pleased with pretty much everything I used up in September, and there was nothing that stuck out as being on my naughty list. I won't be repurchasing the Aromatherapy Associates oils again as their CF status is really hazy and I don't find their ingredients and ethics very transparent (you really have to hunt for everything, and even then it is not entirely clear). I probably will pass on the AA Skincare wipes because they contain phenoxyethonal which really irritates my skin, but I did find them useful for travelling as they kept me fresh and feeling a bit clean, something that is impressive after 24+ hours of journeying! Did any of my empties catch your eye? I would love to hear which you are wanting to try, if any, and what you ended up finishing last month yourself. It's great sharing information and seeing what to skip and what to add to my ever-growing wishlist! Oh my gosh, that is a lot of products! Love the candles, the scents smell amazing! Wow, that's a bumper crop of empties! I love reading posts like this, I think I'm just pretty nosy about what other people use up. Looks like you really took care of yourself in September - keep it up! Great list! I'd love to try Laidbare Pack Your Bags; I'd never heard of it before, but it sounds really good.